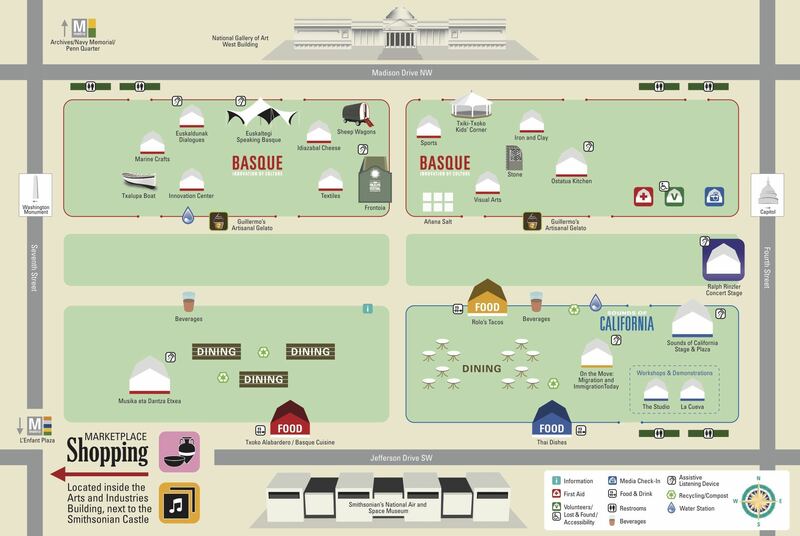 Since the day they announced that Basque Culture was going to be the guest of honor at the 2016 Folklife Festival organized by the Smithsonian, we’ve argued that this event is a key opportunity to let the world know what we Basques are really like. With just over a month left until the event, to be held on the National Mall in the US capital, starts, we’ve already got a general idea of what the representation of the Basque Culture will be like. Yes, this summer there’s going to be a jai alai court on the National Mall, so everyone can see and practice Basque sports. But there will also be a court so spectators can enjoy other demonstrations of Basque culture, such as dantzaris (dancers) and bertsolaris. Dance groups from the US West are getting ready to show off how well they’ve preserved Basque culture in the States, as we can see here and here. Idiazabal cheese, Añana salt, and some of the more typical varieties of Basque peppers will also take center stage. The powerful Basque maritime industry, which for centuries made Basque coastal cities true naval leaders, and which made its seamen key factors in the European discovery of the world and of usable sea routes to every corner of the planet, will also be featured. From those port cities, Basque seamen hunted whales and cod, and even reached the east coast of North America. The traditional methods and new technologies applied to sailing will be represented at Folklife. Another underrepresented but quite necessary job, the netmakers, will also be featured. Our friends at Basque Whalers have drawn up a wonderful summary of everything that’s been announced so far for the Festival. There, we can see, in greater detail, everything there is to know about the Basque presence there. We’d also like to take this opportunity to reminde everyone that Basque Whalers is organizing an irresistible cruise in 2017 along the coast of North America following the trails of Basque Whalers. We spoke about this about a year ago. In the next few days, as the opening date of the festival draws near, we’ll be giving out more details. We’re impatiently looking forward to seeing the whole program to see if some of the “gaps” in territories and themes are filled in. One that we’re missing so far is a bit of coverage on Navarrese wines, from both sides of the Pyrenees; though we mustn’t forget that the presence of La Modelo beer does guarantee a “taste of Navarre” amongst the drinks at the festival.